Hannah Genders takes on a special garden using organic principles. This summer we finished a very special garden in Worcester, special because of the content and the couple it has been designed and built for. John and his wife Cathy live in St Johns, a suburb of Worcester, with their lovely dog Keeley. Keeley is a guide dog, because John is registered blind – and, unusually, John has no sight at all and no light perception. I say unusually because somewhere around 97 per cent of people registered blind have some residual vision. It was John who phoned me last year and asked me to come and see his garden, with a view to having it re-designed and rebuilt. John already had some firm ideas as to what he wanted; a sustainable, edible garden based on permaculture principles. Permaculture can be summed up as a method of organic gardening that works with nature rather than against it – the outworking of this in John and Cathy’s garden was to ensure that each new plant we introduced had a value, either as an edible crop, medicinal value or attracted wildlife, particularly beneficial insects. The challenge in the design phase of the project was to be able to communicate my ideas to John and help him understand the overall picture of what I was trying to achieve. I knew it was possible to have line drawings raised into Braille pictures from some work I’d done previously with a visually impaired child, so I approached RNIB New College in Worcester and they transformed my design into a raised picture so John could feel the overall design and have some idea of what was going where. Once the ideas and outlines were largely agreed we began the reconstruction of the garden. The house is approached through a good-sized front garden enclosed by a low wall. This was retained but the old paving was taken up and replaced by attractive clay pavers in a curved path to the front door. To help with John’s mobility we installed a ‘tapping edge’ to the path: this is a raised paver on edge that he can tap his white stick against as he is walking along. Low-growing conifers were replaced with gravel to open up the space and provide a change in texture. Between the curved path and the low wall is a deep border, and we placed stepping stones into this at convenient intervals for John to be able to maintain the planting. The planting in the front again reflected permaculture principles, with many of the shrubs producing edible fruit for either people or birds. Ground cover plants underneath help cut down on weeds and also provide nectar in early spring for bees and beneficial insects. The rear garden is accessed through a gate at the side. We removed a large shrub that had overgrown here and built a shaded sitting area for John – this is important for him as some of the medication he is on causes his skin to burn in the sun. The wooden pergola over the bench is planted with the honeysuckle ‘Graham Thomas’ for a lovely summer scent. The patio in the back garden was replaced, as the old slabs had numerous trip hazards, and this runs right around the house and into Cathy’s garden. Cathy loves pots and her part of the garden is full of them, with lots of things she has grown from seed and cuttings. 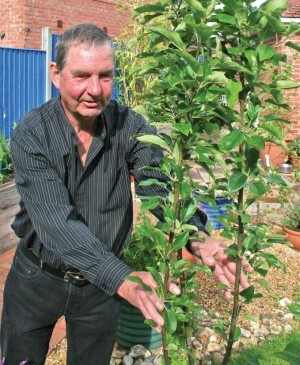 Both Cathy and John are very keen gardeners and John loves growing food, so every space is crammed with edible plants. The lawn is fully planted with apple trees, every variety you can think of to provide apples right throughout the season, all of them grown using organic principles without pesticides. In another example of the permaculture principles and working with nature, where there is a pest problem John introduces a biological control – often a predator of the pest, which is hung in the tree to eradicate the problem. For further growing space, we built a raised bed down one side of the garden for John to grow his vegetables. In an adjoining area, we made a herb spiral using some old rockery stone. This gives height and allows the herbs perfect growing conditions with plenty of free draining soil at their roots and adds an attractive feature to the garden. A new greenhouse was the final part of the rebuild, and this cedar-framed one stands in pride of place in John’s garden. It’s in here that he spends most of his time, tending to his wonderful collection of tomatoes. This summer he has grown 47 tomato plants of many different varieties, both indoor and outdoor. He is always experimenting with new ones, and his favourite this year is a variety called ‘Valencia Gordal’, a sweet plum tomato with amazing flavour. The final detail of John’s garden was to Braille-label the new plants we had put in so he could check the names and locations. John Brailled them and I had a go at reading the labels before tying them onto the plants to see if I could still read Braille, as I have not used it for many years – I think I managed OK but some of my attempts at reading them produced peals of laughter from John. I think this is a garden I will want to visit many times in the future, to see how it develops under John’s careful tending – and to pick his brains on tomato plant varieties!